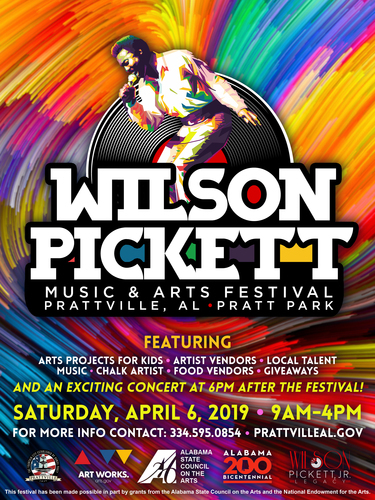 The 2019 Wilson Pickett Music and Arts Festival will feature fun and entertainment for the whole family from 9 am-4 pm at Pratt Park and the Pratt Park Amphitheatre! The first 250 kids through the gates will receive a bag of goodies! The festival features an artist village with local and regional artists for shopping, food vendors, and arts activities for the kids and teens! The stage will feature entertainment all day long, and there are other activities around the park for everyone to enjoy! Pre-register to be a part of the basketball competition or double dutch workshop, and you may even spot a Mustang or two. Come back after the festival for an evening concert at 6 pm in the stadium and dance the night away to all your favorite songs! Admission is free. For more information, contact the Special Events Office at (334) 595-0854. This project is made possible in part by grants from the Alabama State Council on the Arts, the National Endowment for the Arts, the Alabama Bicentennial Commission Foundation and the Wilson Pickett Jr. Legacy, LLC. In Pratt Park near the Stanley Jensen Stadium.